ORCID (Open Researcher and Contributor ID) is a unique researcher identifier. ORCID acts like a DOI, but rather than identifying a digital object, it provides a lifelong digital name. Researchers use their name in many ways: as authors, as investigators on grant proposals, as staff members at a research institute. These examples involve researchers using their name in transactions that require the sharing of information about research, contributions and affiliations. These transactions are stored in different information systems. ORCID allows researchers to insert a unique identifier into these transactions, which makes it possible to easily group and collect research activities. ORCID is fully owned and controlled by the researcher. It doesn’t change, irrespective of funder, affiliation or field of research. AUTHORISE Pure to export your outputs to ORCID. Once Pure is linked to your ORCID record, it will automatically export any new research outputs you add to Pure to your ORCID record daily. You can find more information on how to keep your Pure record up to date, add or import your publications, and link Pure with ORCID at the University's Wiki. The ARC has already enabled users of the ARC RMS to import their publications from ORCID (see 'ORCID integration into ARC RMS' section below). The NHMRC has also announced that imports from ORCID into their new Grant Management System, Sapphire, will be available soon to keep applicants’ publication records up to date automatically. ​You can link your Scopus author profile to your ORCID using the Scopus2ORCID wizard. Follow the steps in the attached document to link your ORCID to your Scopus author profile. During this process you can also request changes to the way Scopus displays your name or affiliation. You can also report publications incorrectly linked to your profile, or that need to be added to your profile, as long as these publications are already indexed in Scopus. These instructions are for linking an existing ORCID to your Scopus author profile. If you do not have an ORCID please follow the instructions to create an ORCID from your Pure profile. This guide explains how to link your ORCID to your Scopus author profile using the Scopus2ORCID wizard. ORCID integration into the Research Management System (RMS) reduces the burden of repeated manual entry of publication data (‘works’) in the grant application process. Your RMS ‘Person Profile’ will be enhanced to include your research output data. Your research output data will be harvested from ORCID by authenticating your ORCID ID in RMS and adding the ARC as a trusted party. You can choose to enter the data manually, or alternatively, use the ‘bulk upload’ facility. Once the data is entered into your RMS person profile, it can be used to auto-populate proposals without having to manually create and update your documents each time you submit a project proposal. Research Office staff can also insert or update ORCID data into a researcher’s profile after the ORCID ID is authenticated, and the ARC is added as trusted party. This means that Research Office staff will also be able to enter research output data at any time for their researchers. All RMS users can now auto-populate their research output data in ARC RMS and add their research output data from their ORCID profile into their Discovery Projects (DP) scheme 2020 application forms. ORCID integration into the Pure and other systems reduces the burden of repeated manual entry of publication data (‘works’). Follow the attached steps to link, add or create your ORCID in PURE. This will allow PURE to export your research outputs directly to your ORCID. This one-page flyer provides a quick overview of what ORCID is, benefits of having an ORCID, as well as how it can be connected with your Pure and Scopus records. 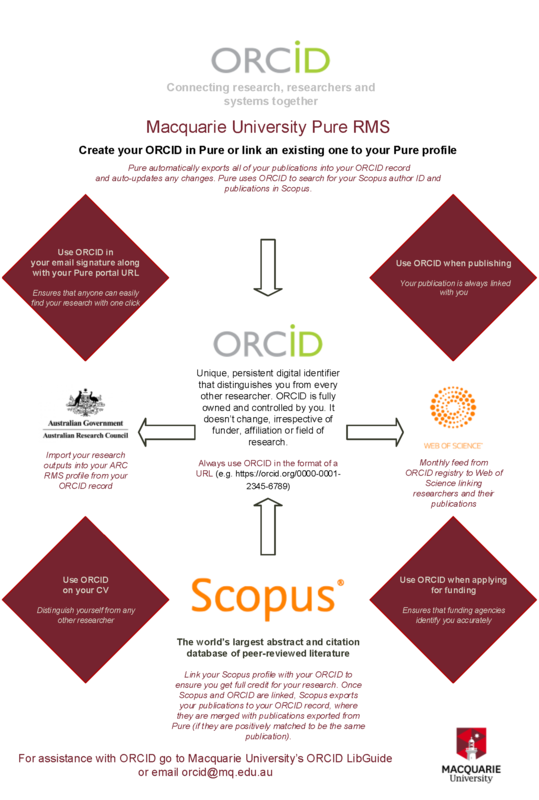 For more detailed information and guides, please see 'ORCID & Pure' and 'Linking your Scopus ID to your ORCID' sections below. I've more than one ORCID ID - what should I do?